This past weekend I got out one of my chocolate cookbooks (cookbooks about chocolate, not made of it) since it had been a while since I'd made anything out of either of them. 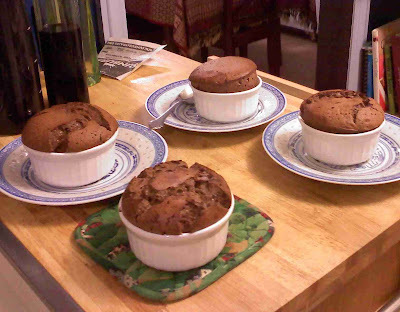 I ended up making chocolate souffles, which were actually quite easy to make. I decided to make four small ones instead of one big one. Craig and Kristi agreed that they were pretty tasty.